"If travel is like love, it is, in the end, mostly because it's a heightened state of awareness, in which we are mindful, receptive, undimmed by familiarity and ready to be transformed. That is why the best trips, like the best love affairs, never really end." — Pico Iyer, "Why I Travel"
ANTHONY BOURDAIN'S "NO RESERVATIONS CUBA"
In March 2011 author Peter Bjarkman appeared in the Havana episode of chef Anthony Bourdain's popular "No Reservations" — a regular Travel Channel feature aired for eight seasons. 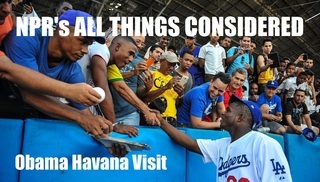 Bjarkman appears in three episode scenes — visiting a Havana little league championship baseball match with Tony, interpreting for Tony during a lively discussion of the Cuban national pastime with fans in Havana's historic Central Park, and attending a Cuban League game with Tony in historic Latin American Stadium. 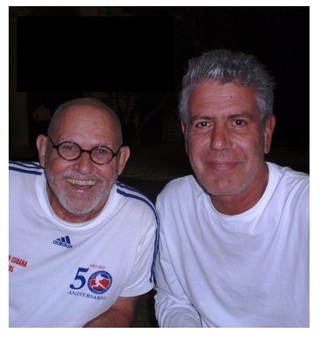 "No Reservations Cuba" first aired on July 11, 2011 and is now available as part of the "Anthony Bourdain No Reservations Collection 7" DVD (subtitled as "Forbidden Detour to Cuba and Beyond"). 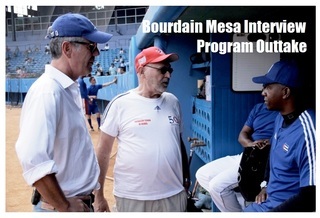 Click on image for link to video excerpt of the show's Havana Park scene with the author translating during Bourdain's debate with Havana baseball fans. 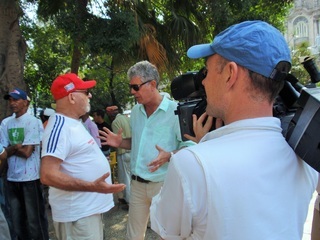 One intriguing scene shot for the NO RESERVATIONS CUBA show but later left on the cutting room floor was the interview with Indiustriales manager German Mesa on the field at Latin American Stadium, with author Peter Bjarkman again translating for Anthony Bourdain. Click on the image here for a view of this lost scene. ESPN 30 for 30 "Brothers in Exile"
This award-winning documentary by Mario Diaz debuted on ESPN "30 for 30" in November 2014 and relates the saga of Cuban half-brothers Livan and Orlando (El Duque) Hernandez who defected from their native island in the 1990s to seek fame, fortune and considerable acclaim in North America's Major Leagues. 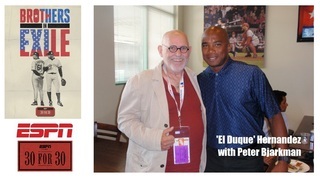 Peter Bjarkman appears as a feature "talking head" and Cuban baseball expert through this acclaimed film. Click the image to which the complete documentary film. 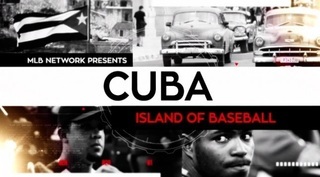 MLB NETWORK "CUBA: ISLE OF BASEBALL"
Released in November 2016, the MLB Productions documentary film "Cuba: Isle of Baseball" relates both the formidable history and recent crises of Cuban national baseball, an institution now torn about by the "defections" for dozens of top island players to the lure of career triumphs and huge paychecks in the North American big leagues. While the film provides heart-wrenching stories of exiled Cuban players torn from their culture and families, it strictly avoids the issues of human trafficking which is the dark side of the MLB-Cuban ballplayer story. 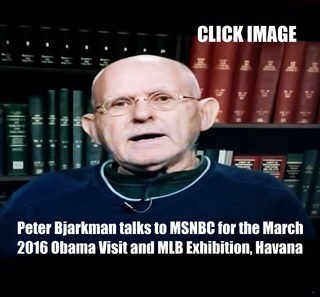 Peter Bjarkman appears as a featured "talking head" and Cuban baseball expert well versed in the subject. 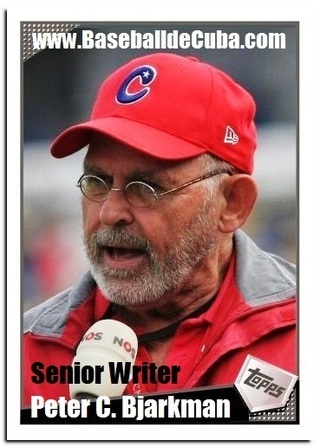 Click the photo for the full MLB episode.